Vintage Trouble - Lasttix. Be first in line for last minute tickets. Wowing audiences across the globe as Vintage Trouble, singer Ty Taylor, guitarist Nalle Colt, bassist Rick Barrio Dill and drummer Richard Danielson are making a much-anticipated return to Australian shores in 2019 for the 30th anniversary of Bluesfest. The American Rhythm & Blues band possesses sharply honed instincts for rhythm and groove and unabashed showmanship. The band first played together in 2010 and soon brought their high energy brand of soul to weekly residencies at local venues like the Edison and Harvelle's Blues Club. The self-branded "TroubleMakers" have built an immense, fervent fan base with their brand of live-wired straight-shootin, dirty-mouth'd, pelvis-pushing juke music – don't miss out as they take Australia by storm again in 2019. 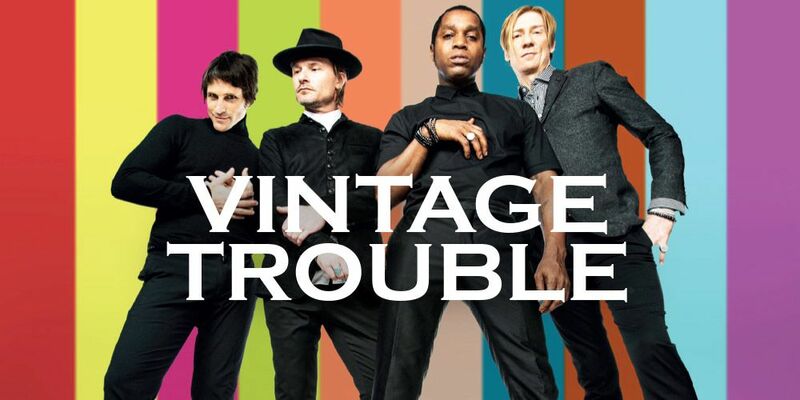 When describing their own sound, Vintage Trouble use the term 'formatted recklessness' a fantastically paradoxical phrase that captures the spirit of a band whose music is wildly unhinged but rooted in real musicality, gut-punching but thought-provoking. Their music is steeped in the heritage of old-school soul but utterly and irresistibly timeless. "Vintage Trouble crafts a sound that meets at the midpoint between Led Zeppelin and James Brown"
"Vintage Trouble is no nostalgia act. These guys are more interested in being timeless than existing in some sort of time capsule"